Etobicoke’s mix of industry and open spaces makes it a beautiful place for both residents and visitors. With both a thriving commercial sector and a population less dense than downtown Vaughan, Etobicoke relies on personal vehicles for work, travel and leisure. All this essential driving can take a toll on any car. To ensure your car is always ready for your commute, Car Detailing Shop offers 100% Mobile Etobicoke car detailing. Etobicoke residents can get the ultimate in convenient, efficient services with our Etobicoke auto detailing which is available throughout the city. To book, simply fill out your address and select a time and our mobile unit will arrive with all equipment needed for your auto detailing in Etobicoke! At Car Detailing Shop, we have years of experience making each car look and drive its best. Whether you need a speedy exterior cleaning or interior shampoo or a completed inside and out auto detailing, our team can service your car quickly and efficiently. 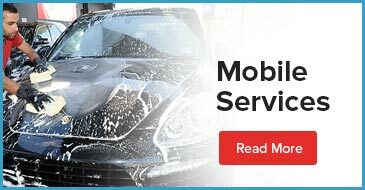 When you choose auto detailing in Etobicoke from Car Detailing Shop, you get a team of dedicated professionals who are experts in removing tough stains, caked on dirt and restoring your car to like new conditions. At Car Detailing Shop, we don’t just pride ourselves on how many customers we have, but how many satisfied repeat customers we see. Our 100% satisfaction guarantee and extensive expert services have gained us over 100 5-star reviews and hundreds more return customers. Car Detailing Shop is also a company that cares about our city, our customers and the environment. This is why we use environmentally sound practices, including reduced water consumption with steam cleaning and minimal chemicals. To experience the Car Detailing Shop difference and find out why we have so many wonderful return customers, book an appointment today with our easy Contact Us form. To ensure more customers can enjoy the benefits of professional car detailing, Car Detailing Shop offers competitive pricing and right-sized packages to suit any need, budget and schedule. Whether you need to fit in a quick interior shampoo package during your lunch break or need a comprehensive car detailing to return your vehicle to like new appearance, Car Detailing Shop has the perfect package for you. We know our customers have busy lives, and this is why we give a detailed time estimate for each car we service. When you book with us, tell us your car’s make and model, and type of auto detailing you require and we’ll give you an accurate estimate of how long the service will take. To book your appointment and choose your appointment time, contact the Car Detailing Shop Team at 647-920-5199!